When we think of mountains and snowfall, the first name that comes to our mind is…. Shimla. Shimla is the most captivating destinations of Himachal Pradesh, where mountainous and natural beauty is talked about. The climatic condition of the destination had also attracted the British. That is why the city was also popular as Summer Capital of India. Shimla is now capital city of the state Himachal Pradesh. The destination has not only numerous places of attractions but has very interesting historical facts. The city is also popular for the heritage properties. The city was named “Shimla” after the name of Hindu goddess, “Shyamala Devi”, who was said to be the incarnation of the famous goddess “Kali”. If we peep through the history of Shimla, we can find that Bhimsen Thapa of the country Nepal invaded the present Shimla in the year 1806. 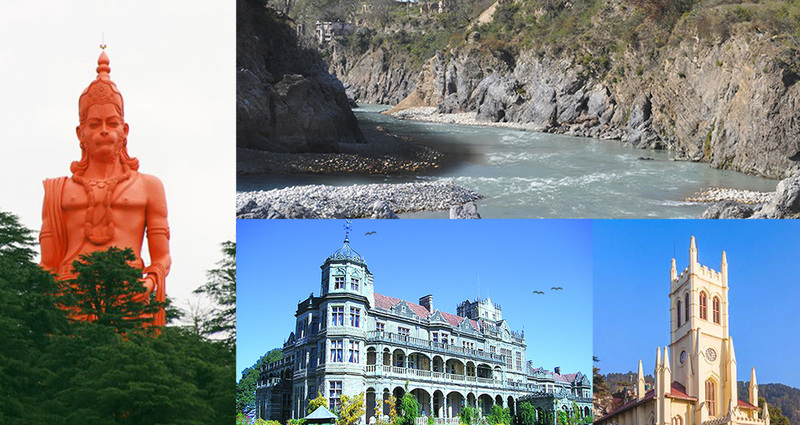 There are lot of facts and places of attractions to be explored in Shimla that cannot be discussed in one go. It will take a lot of leisure time to know about those. Viceregal Lodge: It was the residence of British Viceroy of India. “Rashtrapati Niwas” is new name of this property. Christ Church: It is one of the oldest Church in North India. This is situated on the Ridge near the Mall Road in Shimla. Kalka-Shimla Railway: This is the major tourist attraction in Himachal. This railway line was built by the British and also known as UNESCO World heritage Site. Travelling by toy train to Shimla from Kalka is very joyful. The Mall: This is the popular wandering and shopping place in the city, which is nearby the old bus stand of Shimla. Jakhoo Temple: This is the most popular old temple of Lord Hanuman at the highest peak in the city. There is a statue of the Lord Hanuman with the height of 108 feets. One can be view this statue even far away from the spot. Tara Devi Temple: This temple is dedicated to the goddess of stars and situated at the hill-top. It is 11 kilometres away from the city. Kufri: It is the place of attraction famous as heavy snowfall site, where tourists love to visit and spend their leisure time during holidays. Naldehra: This place is famous for Golf Club with large area. Tattapani: It is a place located near the bank of River Satluj, where one can find hot sulphur springs. That is why the name of place is “Tattapani”, which means hot water.